Anemone Poppy Red & White Blend (Anemone coronaria) is an eye catching combination of brilliant red and bright white flowers. Anemone are a very low maintenance plant and are ideal for planting in any garden. Each bulb produces numerous flowers held above the lacy fern-like foliage, and will begin to flower from mid Winter continuing through to late Spring with a little bit of care and liquid fertilising throughout the flowering season. Excellent for using as cut flowers, lasting 7 to 10 days in the vase. Anemones are ideal for mass displays as they are relatively cheap to purchase and very easy to plant and grow. Prefers a full sun position and tolerates frost well. For best results soak the tuber in tepid water for about 12 hours before planting as this will promote early sprouting. Plant with the pointed end down. 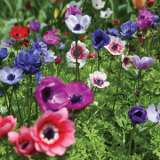 General Information: Anemones have wonderful rich and bright colours, and for picking as a cut flower they are hard to beat. They prefer to be massed in a sunny position. Suitable for Arid, Temperate and Mediterranean climates. Fully hardy – can handle all conditions. Watering: Water well after planting, then weekly until leaves appear. Once up and growing, only water to supplement rainfall. Fertilising: Light organic or chemical fertiliser at planting time. Liquid fertilise regularly once buds start to form. Pests: Bait snails when buds appear. No other specific pest or disease problems are known. Lifting & Storage: Best treated as annual or bi-annuals – new bulbs planted every 1 to 2 years. Tips: To kick start the growing process, soak the bulbs in a bowl of water for about an hour before planting. Need protection from strong winds. Over watering will rot bulbs. Plant up to double the recommended depth in warm climates. Point of bulb faces down.